I was listening to Michael Savage the other day and he brought up the photo op from Obama's surprise visit to Afghanistan and something interesting about it. 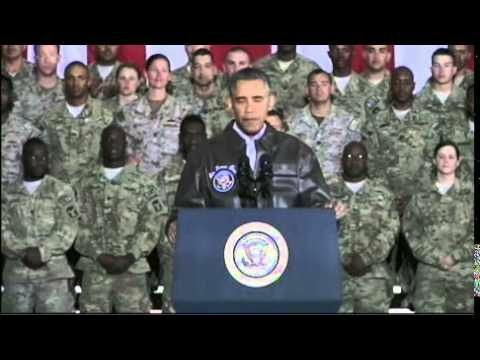 Anyone else notice something about the race and gender demographics of Obama's backdrop during the Afghanistan speech? 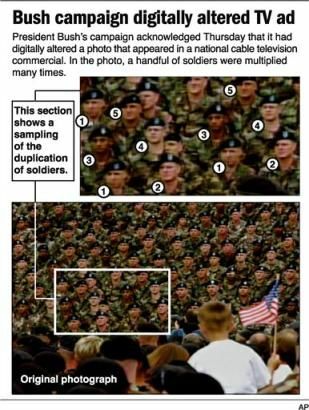 That photo seems pretty statistically unlikely given the makeup of the military. It could be only certain people want to listen to what Obama has to say. Or these people could have been specifically selected to highlight "diversity" in the military. Either way it outlines the length the administration will go to to promote and agenda or it shows how support of Obama is nosediving among members of the military except among those likely to vote D. Maybe it's just finding patterns in static, it could be nothing, but then again it might be something. In the Bush photo it is highly likely that they changed it to get the President literally out of the picture, and so there were Soldiers there, just not those Soldiers. In the Obama photo, most likely they asked for volunteers, and those who are present are representative of the demographics of those that supported him. DeadEye;145077 Wrote: In the Bush photo it is highly likely that they changed it to get the President literally out of the picture, and so there were Soldiers there, just not those Soldiers. In the Obama photo, most likely they asked for volunteers, and those who are present are representative of the demographics of those that supported him. This group is representative of the living 115% that voted for him.